The Ford Ecosport is one of the latest entrants from Ford Motors India and the Renault Duster arrives from the popular brand Renault. The two SUVs have a similar size and shape and it can be a fair comparison if the two are evaluated against each other. The Ford Ecosport is 3999 X 1765 X 1708 mm in dimensions but the Renault Duster is bigger in size with a 4315 by 1822 by 1695 mm chassis. The Ecosport has a bigger height whereas the Duster is longer and wider. The Ecosport has a 200 mm ground clearance and a wheelbase of 2520 mm while the Duster is comparatively bigger with a 205 mm ground clearance and a 2673 mm wheelbase. While the Ecosport comes in 7 paint options, the Duster comes in 6. 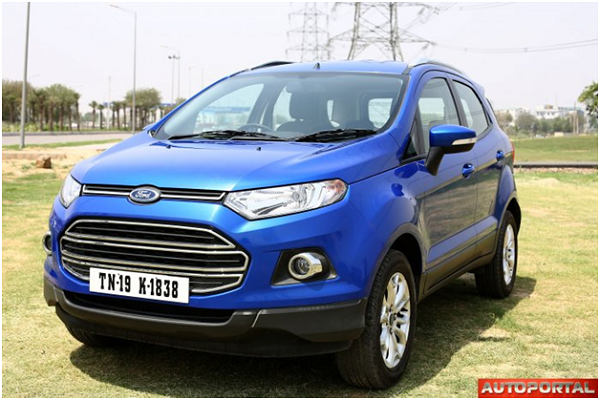 The Ford Ecosport can accommodate 5 individuals in 2 seating rows and has 5 doors. The seating capacity is the same in the Renault Duster. The former has 52 L fuel tank capacity and a 346 L bootspace whereas the Renault Duster has a little shorter fuel tank capacity of 50 L and a larger bootspace of 475 L.
The Ford Ecosport is equipped with a 1498 cc 1.5 L DV5 diesel engine with a maximum power capacity of 89 bhp @ 3750 rpm and a peak torque output of 204 nm @ 2000 rpm. Under the hood of the Duster is a 1461cc 1.5 dCI K9K HP diesel engine that offers a bigger maximum power of 84 bhp @ 3750 rpm and a shorter peak torque output of 200 nm @ 1900 rpm. Both cars have FWD drivetrain technology, 4 in-line valve configuration and 5-speed manual transmission gear box. There is an absence of adequate safety features, such as airbags, anti-lock braking system, power steering and central locking facilities, in both cars. However, the Duster emerges as the better of the two due to the presence of a remote central locking facility. Both cars have their front wheels equipped with disc brakes and their rear wheels paired with drum brakes. Both vehicles comprise of an Independent McPherson strut with coil spring and anti-roll bar front suspension system but the rear suspension is different. The Ecosport has a Semi-independent twist beam rear suspension with twin gas and oil filled shock absorbers. There is a Torsion beam axle with coil springs & anti-roll bar rear suspension system in the Duster. The Ford Ecosport boasts of a better engine power capacity and is ideal for buyers who want a power-packed performance from their vehicle. However, if you would prefer a safer vehicle, the Renault Duster can be a better choice as it arrives with greater safety features.